Started hearing locusts this week. Growing up in northern Ohio that sound always meant one thing, the new school year was right around the corner. Ditto. I have a meeting next Friday and report for inservice on the 27th. HS, MS started yesterday here. First FB game is August 24th. Crazy, I never started before September but guess school lets out for summer break earlier now. Busses started rolling this week. They drive like maniacs too, so I have to be extra careful on this narrow road. The Big Mugg is on heavy duty now too. DPs in the low to mid 70s. Feels like it's raining even when it isn't. Have also noticed some leaves turning already. Every state is different. Minnesota start dates are really controlled by tourism. Resorts need help until Labor Day and the state fair ends on Labor Day. So their lobby forces schools not start until the first Tuesday after Labor day. Sometimes that is really late. But FB has a game Aug. 31. Friday of Labor Day weekend. So to me-We could start earlier and get done earlier. No one will love every schedule. Last year-the last Thursday in August had :Back to school nights, HS football, Twins game, Vikings preseason and U of Minnesota Home game. F****** insane. My kid is at North Dakota State and they start classes Aug 21. Since this is about weather-Last August we had 6.5 inches of rain. This year- 1.13 inches. I think that is more normal. I was in AZ 29 July-5 August. Schools were open on 1 August. Never saw the like. I spent a lot of years in public education, and the earliest kids came in the door was around 20 August. But as Valentine says, it is different now. KS schools started this week. Glad to be retired....Every day is a snow day. I was in AZ 29 July-5 August. Schools were open on 1 August. Never saw the like. I've been in Tucson 30 years now and it certainly took me a while to get use to my daughters "new" schedule. Back east it was around the second week of Sept. thru the second week of June. Raised in VA and we never started before Labor Day. Long years ago. Now Loudoun County in Va starts in 23 August and is done 7 June. Schools are air conditioned now so it is a lot more comfortable. The low pressure system that brought rain to us Saturday night and Sunday seems to be unusual for this time of year. We had no thunder/lightning in my area, which is how we get a lot of our precip during summer months. This seemed to be a well organized, slow moving system not typical for August. Any comments from more knowledgeable Great Plains members or others? Hmm, woke up this morning and saw that Hurricane Lane is going to be pushing pretty close the main Hawaiian islands. I don't really know what to think, because I've personally never seen (in real time) such a strong storm get so close to Hawaii. PS. Does this belong in the tropics area of the forum or can it go here? At 57, this is the first time we've been below 60 since May 8th. After a few cool but cloudy days, maybe back to the low 90s for a few days. Hopefully not too many more. Extremely hot and humid over here... and the pattern only gets worse... .
"...over here..." doesn't help much with your location. 3.6 inches of rain in 2 hours today. 3.6" was easily topped in Oklahoma on Friday. 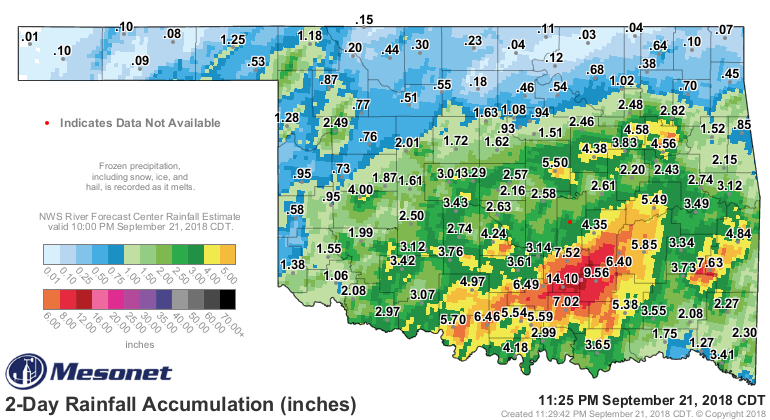 Southern Oklahoma was targeted for another heavy rainy period in the state, peaking out at 14.10" in 10 hours, so far. Amounts quickly tapered off going north, so I only got .74". Oklahoma City and Tulsa areas got 2 to 4+ inches. Fortunately, other than flash flooding, there were no other problems associated with severe weather. It was the result from the remains of a tropical low coming up from the south meeting with a slow moving cold front.